It’s easy enough for false information to spread through likes and shares on Facebook. But what about the ads? Those people who pay Facebook, hoping to buy your click? One tactic caught our attention: using the face and name of a state governor to try to convince people they can get free stuff. In this case, solar panels. Who wouldn’t want to get free electricity? Is California giving away $100 million worth of solar panels? No, but there are still meaningful incentives you can receive to help reduce the cost. This screengrab shows a facebook group called “Solar Energy Today” claiming that Gov. Gavin Newsom (D-California) is giving away $100 million worth of solar panel incentives. We Verified that he isn’t, but there are still incentives you can use to make solar installation cheaper. CLAIM: There is a new 2019 policy. Gov. Gavin Newsom will release $100 million solar incentives for CA home solar expansion. One way you can tell this ad is fishy: there’s another version of this ad still running that features California’s prior governor, Jerry Brown. In nearly identical wording, it promotes the idea that he’s giving away the solar panel money under a new 2018 policy. Get a daily e-mail with stories that inform, offer tips, and make you smile. Thank you for signing up for the Daily Blend Newsletter. 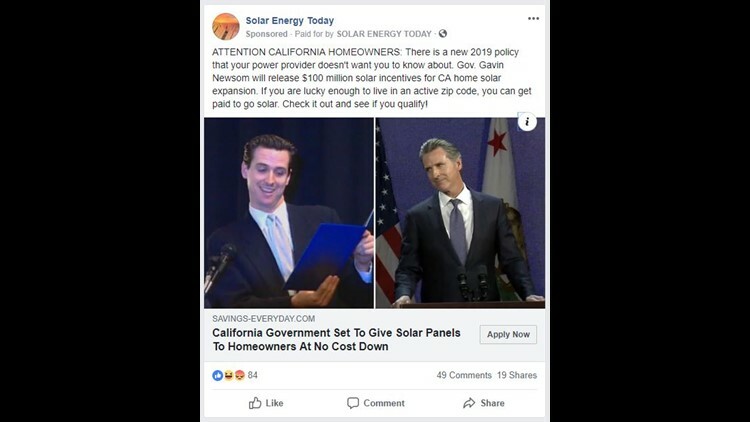 By digging into Facebook’s ad archive, you can see the same Facebook group behind this ad (Solar Energy Today) is running other ads that claim the same solar giveaway is being made by the governors Arizona, Connecticut, Delaware, Florida, Massachusetts, New Jersey, New Mexico, New York, and Texas. Weird that all those govs came up with the same solar plan, right? On the off chance this really was just some wild coincidence, we hit up the California Energy Commission. The commission told us that there is no new 2019 policy. There used to be a big incentive program called the California Solar Initiative, but it closed in 2016. As for the details of our now-debunked solar giveaway– no, Governor Newsom will not “release” $100 million worth of solar incentives. First off, that’s not how the state spends your tax dollars. The governor doesn’t get to just “release” money. We have checks and balances. The governor has to ask the legislature to pass a budget he or she will sign. Newsom’s first budget is just coming into shape, but his first-ever budget proposal doesn’t have a $100 million solar incentive in it. If you follow the news, you know that California has moved away from the proverbial carrot and is now using the stick when it comes to solar. The state is going to require solar panels on new homes starting next year. The state does still have one solar incentive going, which used to have $100 million behind it. It’s called SASH, but it’s only for people who live in qualified affordable housing. It’s not new. It’s been around since 2006. As a result, more than 80 percent of the money in that program’s gone now. Bottom line: this group advertising on Facebook appears to be trying to make money by selling referrals to local solar panel installers, hoping to make you think the state will foot the bill for most or all of it, though the website didn’t function properly for us when we attempted to see what referrals it might recommend. The ads from Solar Energy Today and several similar groups all point to a website called home-saving.net. We reached out to the company for comment, but received no response. CLAIM: You can get paid to go solar. We’ve debunked this apparent middleman’s claim, but that doesn’t mean that everything they say in their post is wrong. You can, in fact, get paid to go solar. There is still a federal tax incentive, which will cover 30 percent of the cost to install solar on your house. That deal winds down to a lower percentage after this year and goes away in 2022. You don’t need middleman to get it. Just find a licensed installer and make sure you claim the credit on your taxes. There are some small local incentives available as well. In Sacramento, SMUD will give you $300 to go solar. That’s hardly enough to pay for a whole system, but better than a poke in the eye. Even when all the incentives go away, you can still get paid to go solar. When your home solar panels make more power than you use, your power meter runs backwards. In turn, you get paid for the power you sell to the grid thanks to a policy called “net metering” that’s been adopted in California and several other states. BOTTOM LINE: We verified that the whole premise of this Facebook ad is bunk. Gavin Newsom simply is not going to buy you a solar system, though there are other incentives to learn about if you’re in the market for panels. Have a tip about this or any other story? Email Brandon at brittiman@abc10.com or continue the conversation with Brandon on Facebook.